To Cite: Tortosa F. Expression of Pro-Apoptotic P53 Tumor Suppressor Gene in Pituitary Adenomas: Comparison with Anti-Apoptotic Bcl-2 Oncoprotein , Arch Neurosci. Online ahead of Print ; 6(1):e68867. doi: 10.5812/ans.68867. Background: While a great deal of attention has been paid to the study of the control of hormone secretion from Pituitary Adenomas (PAs), less attention has been paid to the study of molecular events that underlie the development of these tumors. Objectives: The goal of the present study was to analyze the expression of p53 tumor suppressor gene to allow for its comparison with that of oncoprotein bcl-2 in a series of PA patients followed for a minimum of nine years. Methods: This retrospective study included 51 patients diagnosed with a PA (33 nonfunctioning, 13 acromegaly, 4 Cushing’s disease, and one prolactinoma), who underwent trans-sphenoidal surgery at a single center between 2006 and 2008. P53 and bcl-2 expression were immunohistochemically evaluated and correlated with clinico-radiological and histopathological tumor parameters, as well as post-operative progression/recurrence. Results: Out of 51 tumors, 40 were categorized as typical and 11 as “atypical” PAs. From typical PAs, 28 showed positivity for p53 (cellular mean: 0.99%) and 20 for bcl-2 (cellular mean: 0.58%); from “atypical”, seven had p53 positive cells and six bcl-2 (mean: 2.02% and 0.73%, respectively). Nineteen (37.25%) were positive for the two markers. There were no differences in the expression of p53 and bcl-2 with regards to age or gender of the patient, size, invasiveness or post-operative tumor recurrence. Conclusions: In the study group, p53 and bcl-2 were abnormally expressed in 68.63% and 50.98% of pituitary tumors, respectively. One-third of PAs were co-expressed across both immunomarkers. The simultaneous genetic complementation of deregulated p53 and bcl-2 is implicated through the apoptosis regulation pathway in the pathogenesis of these tumors. Despite recent advances in our understanding of (PAs), their exact ontogeny and carcinogenesis are still underspecified. A number of genetic aberrations contribute to the pathogenesis of these tumours, of which the most notable are the suppressor gene function loss and the activation of cellular proto-oncogenes (1, 2). Research findings indicate that the genetic regulation of apoptosis is essential during the stage of tumorigenesis as oncogene and tumour suppressor genes are capable of regulating the susceptibility or the rate of cells that go through apoptosis (3, 4). Apoptosis, a type of cell death, in which cells die in a controlled and programmed manner, is regulated by a number of different genes (5) and is considered to be a swiftly processed array of events, leading to the removal of damaged cells. This takes place in proliferative conditions, physiological remodelling, as well as neoplastic lesions (6, 7). Apoptosis has been shown to be an important process in pituitary oncogenesis (7) and in pituitary neoplastic lesions (8, 9). P53 and bcl-2 oncoproteins are only some of many factors that are involved in cell proliferation and apoptosis, as well as in the regulation of differentiation and growth processes (10). Localized on the short arm of chromosome 17 at position 17p13.1 is a tumor suppressor gene, known as p53. This is a negative regulator of G1-S phase transition in the cell cycle that is capable of stimulating the death of the cell in response to DNA damage. In this way, p53 precludes both the proliferation and the reproduction of abnormal cancer cells. Of note, the most common genetic alteration during carcinogenesis (11) that makes up for over 50% of diagnosed human cancers (12) is that of sporadic mutations in this gene. Protection from apoptotic cell death is often associated with bcl-2 protein, which is a protein that blocks programmed cell death (13). Finally, the type of gene that encodes the bcl-2 protein is localized on chromosome 18 and is the bcl-2 gene (14). Due to its high expression in cells, this gene counteracts pro-apoptotic protein function and may potentially contribute to the survival of the cell (15). To assess the impact on the biological behavior of PAs, the goal of the present research was to determine the expression of p53 tumour suppressor gene and bcl-2 oncoprotein, by immunohistochemical techniques. These techniques were used in a series of primary pituitary tumours of patients followed for at least nine years, correlating this expression with clinico-radiological and histopathological tumoral parameters and its progression or recurrence. This retrospective descriptive study included 51 patients with PA, 26 (51%) females and 25 (49%) males, aged 29 to 81 years (mean: 54.5 ± 14.5 years), undergoing surgery for pituitary gland at the Santa Maria University Hospital of Lisbon, Portugal, between 2006 and 2008. The patients’ diagnosis was achieved by using standard clinical, biochemical and imaging criteria. Tumor tissue samples were obtained by trans-sphenoidal resection and each patient was followed for at least nine years after surgery, to evaluate the recurrence rate. From the 51 patients, 33 had clinically non-functioning tumors, 13 corresponded to acromegaly, four to Cushing’s disease, and one had elevated prolactin. The final diagnosis was based on the clinical and histopathological results of the post-operative samples that were classified according to the World Health Organization (WHO) criteria for PAs (16). Following this classification, PAs are categorized as typical (with a bland histological appearance, rare mitotic figures, and a proliferative index [Ki-67] lower than 3%), or atypical (with atypical morphological characteristics, such as invasive growth, a high mitotic index, a cellular proliferation index [Ki-67] greater than 3%, and extensive immunostaining for p53 protein). Prior permission for the treatment of patients’ tissues was obtained from the ethics committee of the hospital, thus complying with the requirements of the Helsinki Declaration. Histopathological studies were performed on tissue sections placed for 24 hours in buffered formalin and embedded in paraffin wax, according to a constant protocol. Sections of two microns thickness were cut for histochemical study or three microns thick for the immunohistochemical analysis. With regards to the immunohistochemical study, the sections underwent antigenic recovery and were later incubated with individual antibodies directed to specific pituitary hormones (prolactin, growth hormone, thyroid-stimulating hormone, adrenocorticotropic hormone, follicle-stimulating hormone, and luteinizing hormone) or cellular proteins (Ki-67, a marker of cell proliferation). The detection of oncoprotein expression was achieved by applying commercially prepared monoclonal antibodies that are specific for each protein (Table 1). Immunohistochemical staining was carried out by using an automated immunohistochemical processor (Ventana BenchMark XT, CA, USA). Positive and negative controls were made on the specificity of the primary antibodies, according to the manufacturer’s instructions. Histological sections of ten normal pituitary glands were obtained at necropsy from cadavers aged between 26 and 83 years (mean: 67.8 ± 12.9 years) and were processed in a similar manner and analyzed as a control group. The researchers were not aware of the pathological and clinical diagnosis prior to analysis of the immunohistochemical results. The labeling index of the oncoproteins was evaluated quantitatively by one pathologist as the percentage of positive nuclei in 500 to 1000 tumor cells, analysed under an optical microscope at 400 × magnification. With regards to more demanding cases, an image processing program for immunohistochemical analysis was used to calculate the index (ImageJ 1.49, National Institutes of Health, USA). A basic statistical and comparative analysis appropriate to the distribution of data was performed using the GraphPad Prism version 7 statistical software for Windows (GraphPad software, Inc., CA, USA). A two-tailed Fisher’s exact test (bilateral) was used to compare categorical data; the unpaired t-test was used to compare subgroups. All effects were reported as significant at P value < 0.05 (with a 95% confidence interval). The current study observed positivity for p53 and bcl-2 in 68.63% (35/51) and 50.98% (26/51) of all PAs, respectively. Of the 35 p53 positive and 26 bcl-2 positive tumours, 19 (37.25%) were positive for both oncoproteins. Out of 51 tumors, 40 fell under classification as typical PA and 11 were classified as “atypical”. From typical cases, 28 showed positivity for p53 (with a mean value of neoplastic cells of 0.99%) and 20 for bcl-2 (mean of neoplastic cells: 0.58%); for nonfunctioning (n = 25) 1.29% and 0.48%, respectively; for patients with acromegaly (n = 11), 0.87% and 1.2%, respectively; for patients with Cushing’s disease (n = 3) 0% and 0.33%, respectively, and for the patient with prolactinoma 1% and 0%, respectively. On the “atypical”, seven showed positivity for p53 (with a mean value of 2.02%) and six for bcl-2 (mean: 0.73%); for the nonfunctioning (n = 8), 2.7% and 0.89%, respectively; for patients with acromegaly (n = 2), 2% and 1%, respectively, and for patients with Cushing’s disease (n = 1), 0% for both markers (Figures 1 and 2). Nonfunctioning adenomas with immunohistochemical positivity for prolactin (n = 10) and adrenocorticotropic hormone secreting adenomas that produced Cushing's disease (n = 4), were the highest and lowest of all the subtypes analyzed in both groups (mean of p53: 4.17% and 0%, respectively). The main value of p53 and bcl-2 expression in the postmortem pituitary glands, used as a control group, was 0% and 0.2%, respectively. No significant differences were observed in the expression of both oncoproteins with regards to the number of immunoreactive tumors and the percentage of immunopositive cells, and the age or gender of the patient (women compared to men: P = 1.0000). No differences were found in the expression, according to the tumoral size previously determined by magnetic resonance imaging (MRI) (microadenomas [tumors < 1 cm] versus macroadenomas [tumors ≥ 1 cm]: P = 1.0000). No differences were found in patients with invasive tumors of the surrounding tissue as compared to patients without these types of tumors (P = 0.4941). In this study only primary tumors were considered; at the time of the last post-operative follow-up, in 35.3% of the patients (18/51) a progression or recurrence of the pituitary tumor was reported, defined as reappearance of the tumor in imaging studies for nonfunctioning as functioning adenomas, as well as hormonal hypersecretion for functioning tumors. No differences were found in patients with tumor recurrence when compared to patients without recurrence (P = 0.1877). The p53 and bcl-2 immunoreactivities with regards to the different pituitary tumour groups are presented in Table 2. Abbreviations: ACTH, adrenocorticotropic hormone; FSH, follicle-stimulating hormone; GH, growth hormone; LH, luteinizing hormone; MRI, magnetic resonance imaging; PRL, prolactin; TSH, thyroid-stimulating hormone. aStatistical significance: P < 0.05. In conclusion, PAs can be divided to functional and non-secreting. While a great deal of research attention has been devoted to the control of hormone secretion from these adenomas, less attention is paid to molecular events that give rise to the development of such tumours. Prior research has shown that the deregulation of programmed cell death appears to play a crucial role in multistep tumorigenesis (3, 4). A number of candidate genes, among which p53 and bcl-2 deserve special mention, contribute substantially to the regulation of programmed cell death (13, 17). Not least important, the deregulation of these genes is essential in the development of malignant tumours (18, 19). The research reported in this paper concerns the expression of the p53 and bcl-2 oncoprotein human pituitary tumours. Out of a total sample of 51 PAs, p53 immunoreactivity was detected in 35 and bcl-2 immunoreactivity in 26 PAs. Still other 19 cases turned out to be positive with regards to both oncoproteins, and thus it is proposed that there is an association of expression between p53 and bcl-2. P53 is crucial in protecting the integrity of the cellular genome as well as defending the cell from malignant transformation. A more stable protein, which can now be effectively detected via immunohistochemistry, may be produced through the mutation of the gene. The data demonstrated p53 immunoreactivity in 68.63% of adenomas. At the same time, no evidence was found concerning immunoreactivity in any of the normal pituitary tissues. These findings point to the apparent disconnect between earlier studies showing that p53 gene abnormalities constitute the minority of PAs and the majority of pituitary carcinomas (18), and the data showing a high level of p53 immunoreactivity. The reason for such a disparity in the results may be related to the high number of “atypical” PAs in the study group. Indeed, in line with Wierinckx et al.’s (19) results, the current study observed that adenomas with immunohistochemical positivity for prolactin were associated with higher expressions of p53. In another study (20), Ki-67, p53, and bcl-2 expressions were found significant in the PRL-secreting group. The routine use of p53 immunohistochemistry for PAs was controversial. These mixed findings seem to suggest that p53 cannot be considered an independent prognostic factor capable of determining the aggressive behavior of pituitary tumors. The expression of bcl-2 in a number of PAs leads to the conclusion that it plays an important role in their pathogenesis. The reason for this is that in these kinds of tumors, which are slow growing, it could represent an initial event leading to indolent tumour growth. The current research found bcl-2 immunoreactivity in 50.98% of adenomas as compared to 75% of Ozer et al. (7) as well as in 20% of normal pituitary tissue, thus pointing to its potential as an important marker in the event of tumor progression. Bcl-2 is of utmost importance for the regulation of apoptosis. It has been well-established that bcl-2 guides cell survival even in the event of low rate of cell proliferation, hence providing a growth advantage that may in turn give rise to neoplastic transformation. Despite the fact that studies investigating the possible co-localisation of p53 and bcl-2 in individual cells were beyond the intended scope of this research, it is nevertheless worth pointing out a notable association concerning the presence of p53 and bcl-2 immunoreactivities across tumours. The above-mentioned co-expression could indicate that bcl-2 establishes a mechanistic basis for oncogenic synergy that takes place between these two proto-oncogenes in PAs. The establishment of such a basis is achieved by lessening the apoptotic effects of deregulated p53 expression without affecting its ability to stimulate continuous cell growth. Decreased expression of bcl-2 and accumulation of p53 has been associated with bromocriptine-induced apoptosis in PA cells (21). One study revealed that the p53 protein was co-expressed with the bcl-2 protein during the formation of the normal pituitary gland (10). In another study, Ahlbom et al. demonstrated that the cell remodeling of the anterior pituitary, after the termination of lactation, occurs through the process of apoptosis and involves changes in Bax, bcl-2, and p53 (22). It could be speculated that in regions of intense cell division, the expression of p53 might be necessary to prevent inappropriate and uncontrolled proliferation that is generally related to severe modifications in cell alignment, as well as the appearance of different disorders. While Ozer et al. (7) suggested a significant relationship between the proteins related to apoptosis and hormonal function in PAs, Green et al. (23) found no significant association between apoptosis and p53 protein expression. Although the sample size (51 patients, with a wide range of age and different histological groups of PA) was larger relative to other studies in this area, it is nevertheless still limited, allowing for limited ability to detect significant differences between groups. The study’s limitations include the retrospective nature of the data collection that can introduce bias because of differential loss to follow-up. Although the current results differed from those reported in earlier studies, one cannot but notice that there is still a paucity of research on p53 and bcl-2 expression in pituitary tissues. Thus, further exploration of this topic is warranted to confirm these preliminary findings. In summary, the abnormal expression of p53 and bcl-2 in certain pituitary tumors could play a role in their carcinogenesis. The simultaneous genetic complementation of deregulated p53 and bcl-2 could be implicated through multistep tumorigenesis of pituitary tumours. The author would like to thank Ana Raquel Henriques and Oleksandr Horchak for providing assistance with the English proofreading. Authors' Contribution: Francisco Tortosa developed the original idea and the protocol, abstracted and analyzed data, wrote the manuscript, and is a guarantor. Conflict of Interests: There were no conflicts of interests in this study. 1. Bishop JM. The molecular genetics of cancer. Science. 1987;235(4786):305-11. doi: 10.1126/science.3541204. [PubMed: 3541204]. 2. Asa SL, Ezzat S. The pathogenesis of pituitary tumours. Nat Rev Cancer. 2002;2(11):836-49. doi: 10.1038/nrc926. [PubMed: 12415254]. 3. Williams GT, Smith CA. Molecular regulation of apoptosis: genetic controls on cell death. Cell. 1993;74(5):777-9. doi: 10.1016/0092-8674(93)90457-2. [PubMed: 8104100]. 4. McDonnell TJ. Cell division versus cell death: A functional model of multistep neoplasia. Mol Carcinog. 1993;8(4):209-13. doi: 10.1002/mc.2940080402. [PubMed: 8280368]. 5. Rezvani M, Barrans JD, Dai KS, Liew CC. Apoptosis-related genes expressed in cardiovascular development and disease: An EST approach. Cardiovasc Res. 2000;45(3):621-9. doi: 10.1016/S0008-6363(99)00383-1. [PubMed: 10728383]. 6. Kapranos N, Kontogeorgos G, Horvath E, Kovacs K. Morphology, molecular regulation and significance of apoptosis in pituitary adenomas. Front Horm Res. 2004;32:217-34. doi: 10.1159/000079047. [PubMed: 15281349]. 7. 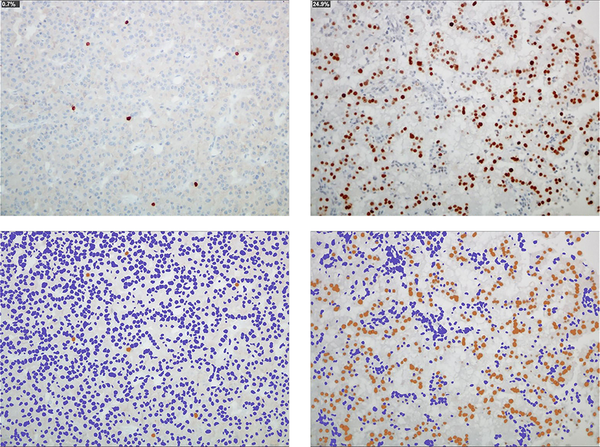 Ozer E, Canda MS, Ulukus C, Guray M, Erbayraktar S. Expression of Bcl-2, Bax and p53 proteins in pituitary adenomas: An immunohistochemical study. Tumori. 2003;89(1):54-9. doi: 10.1177/030089160308900112. [PubMed: 12729363]. 8. Kontogeorgos G. Classification and pathology of pituitary tumors. Endocrine. 2005;28(1):27-35. doi: 10.1385/ENDO:28:1:027. [PubMed: 16311407]. 9. Kontogeorgos G. Predictive markers of pituitary adenoma behavior. Neuroendocrinology. 2006;83(3-4):179-88. doi: 10.1159/000095526. [PubMed: 17047381]. 10. Saraga-Babic M, Bazina M, Vukojevic K, Bocina I, Stefanovic V. Involvement of pro-apoptotic and anti-apoptotic factors in the early development of the human pituitary gland. Histol Histopathol. 2008;23(10):1259-68. doi: 10.14670/HH-23.1259. [PubMed: 18712678]. 11. Nigro JM, Baker SJ, Preisinger AC, Jessup JM, Hostetter R, Cleary K, et al. Mutations in the p53 gene occur in diverse human tumour types. Nature. 1989;342(6250):705-8. doi: 10.1038/342705a0. [PubMed: 2531845]. 12. Greenblatt MS, Bennett WP, Hollstein M, Harris CC. Mutations in the p53 tumor suppressor gene: clues to cancer etiology and molecular pathogenesis. Cancer Res. 1994;54(18):4855-78. [PubMed: 8069852]. 13. Hockenbery D, Nunez G, Milliman C, Schreiber RD, Korsmeyer SJ. Bcl-2 is an inner mitochondrial membrane protein that blocks programmed cell death. Nature. 1990;348(6299):334-6. doi: 10.1038/348334a0. [PubMed: 2250705]. 14. Tsujimoto Y, Cossman J, Jaffe E, Croce CM. Involvement of the bcl-2 gene in human follicular lymphoma. Science. 1985;228(4706):1440-3. doi: 10.1126/science.3874430. [PubMed: 3874430]. 15. LeBrun DP, Warnke RA, Cleary ML. Expression of bcl-2 in fetal tissues suggests a role in morphogenesis. Am J Pathol. 1993;142(3):743-53. [PubMed: 7681256]. [PubMed Central: PMC1886804]. 16. Lloyd RV, Kovacs K, Young W, Farrel WE, Asa SL, Trouillas J, et al. Tumours of the pituitary gland. In: DeLellis RA, Lloyd RV, Heitz PU, Eng C, editors. World Health Organization classification of tumours. Pathology and genetics of tumours of endocrine organs. Lyon, France: IARC Press; 2004. p. 9-47. 17. Czabotar PE, Lessene G, Strasser A, Adams JM. Control of apoptosis by the BCL-2 protein family: Implications for physiology and therapy. Nat Rev Mol Cell Biol. 2014;15(1):49-63. doi: 10.1038/nrm3722. [PubMed: 24355989]. 18. Thapar K, Scheithauer BW, Kovacs K, Pernicone PJ, Laws ER Jr. p53 expression in pituitary adenomas and carcinomas: Correlation with invasiveness and tumor growth fractions. Neurosurgery. 1996;38(4):765-70. discussion 770-1. doi: 10.1097/00006123-199604000-00027. [PubMed: 8692397]. 19. Wierinckx A, Auger C, Devauchelle P, Reynaud A, Chevallier P, Jan M, et al. A diagnostic marker set for invasion, proliferation, and aggressiveness of prolactin pituitary tumors. Endocr Relat Cancer. 2007;14(3):887-900. doi: 10.1677/ERC-07-0062. [PubMed: 17914117]. 20. Moldovan IM, Susman S, Pirlog R, Jianu EM, Leucuta DC, Melincovici CS, et al. 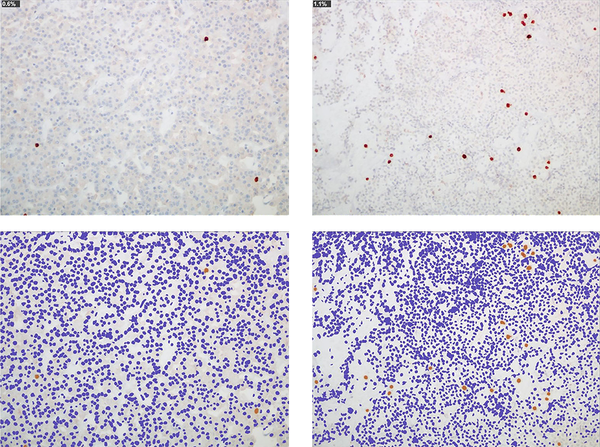 Molecular markers in the diagnosis of invasive pituitary adenomas-an immunohistochemistry study. Rom J Morphol Embryol. 2017;58(4):1357-64. [PubMed: 29556628]. 21. Yin D, Tamaki N, Kokunai T, Yasuo K, Yonezawa K. Bromocriptine-induced apoptosis in pituitary adenoma cells: Relationship to p53 and bcl-2 expression. J Clin Neurosci. 1999;6(4):326-31. doi: 10.1016/S0967-5868(99)90057-7. [PubMed: 10844757]. 22. Ahlbom E, Grandison L, Zhivotovsky B, Ceccatelli S. Termination of lactation induces apoptosis and alters the expression of the Bcl-2 family members in the rat anterior pituitary. Endocrinology. 1998;139(5):2465-71. doi: 10.1210/endo.139.5.5985. [PubMed: 9564859]. 23. Green VL, White MC, Hipkin LJ, Jeffreys RV, Foy PM, Atkin SL. Apoptosis and p53 suppressor gene protein expression in human anterior pituitary adenomas. Eur J Endocrinol. 1997;136(4):382-7. doi: 10.1530/eje.0.1360382. [PubMed: 9150697].